Many first time skiers gravitate towards big name resorts, typical due to recommendations from friends and family or from TV travel shows. If you are a 1st time skier, you really do not need a big name resort, as you are not going to benefit from what most of these areas offer. 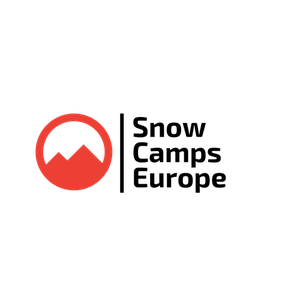 “A LARGE SKI AREA”, a mass of “OFF PISTE”, etc. The facts are, as a beginner, you are going to spend your first one or two days learning the basics in a ski school teaching area. You are then likely to move on to a teaching slope, located close to the village. Then, once you have mastered the basics and can perform a “Snow Plough Turn” and can control your speed, you will move on up the mountain to gain valuable mileage on the gentle blue runs. So do not think big resort, think beginner resort! You will save money as you will not be paying a premium for features you are not going to benefit from. Many of the leading tour operators offer ´learn to ski´ weeks for first time skiers with an all-in-one price covering your flights, transfers, accommodation, equipment, lift pass and ski school. 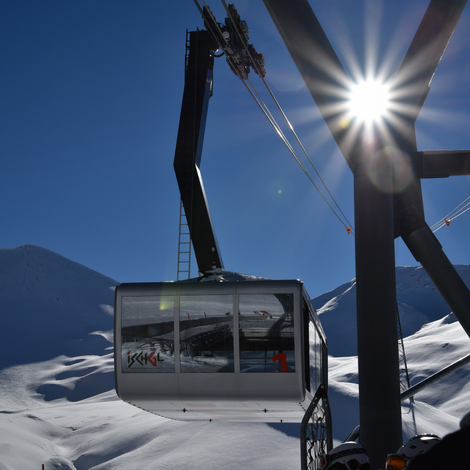 These are typically at smaller, beginner-friendly resorts, such as; Kaprun in Austria, Bansko in Bulgaria, Chamrousse in France, Pila in Italy, Kranjska Gora in Slovenia. Some people will also tell you to consider what other activities you would like to do while on your ski holiday. But trust us, you are going to be tired after a day of ski school. And after a little Après Ski, it will soon be time for your evening meal and then your bed. Your partner, friends / family have been skiing for years, are very experienced and they will be teaching you. Good but guess what, it is all going to end badly! Let us put it like this; would you let your partner cut your hair, given they have no hair dressing experience? No, did not think so. So do not allow them to teach you to ski, given they probably are not qualified to do so. And even if they are, they would probably be teaching you illegally and without insurance. They also may not know the mountain as well as they think, and you are going to end up on a run that is way too hard for your ability level. However strong your relationship is, within a very short time they are going to get bored, and you are going to get frustrated, lose all of your confidence and before you know it there will be tears. We see just this ever week. Not only are you going to have the worst first day on the slopes, but you are now going to get yourself into ski school a day later than all of the other beginners and you are going to already be behind the rest of your group. So do you and your partner/friends/family a favour, and get to ski school from day one and join a 5-day beginner course, in our opinion the best way to learn to ski! You are going to meet lots of people all at the same level, you are going to have more fun, make new friends, and you will also get more time to rest in-between runs, not to mention group lessons are more cost effective. 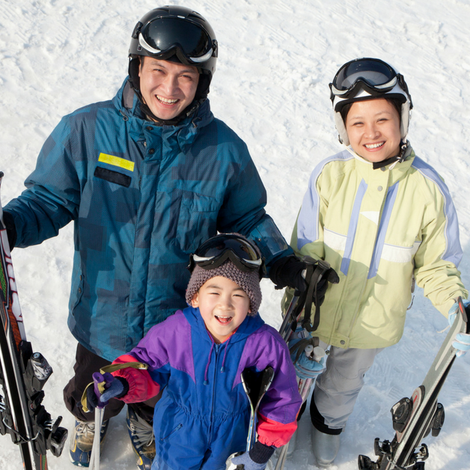 Now if you are a young family and you are budget driven, you will see many ski schools offer what they call a “Happy Family” course. For Mum, Dad, little Jonny (3 years) and Mary (8 years). These offer great savings… But you are more likely to be an “unhappy family” than a happy one for the rest of your holiday. Adults and children learn in very different ways and for a ski instructor to teach you all effectively, it just does not work to be in one group. Children learn buy playing and experimenting, while Mum and Dad need explanations and demonstrations. Your ski instructor, however good, will not be able to keep you all happy at once, especially your youngest ones. So what is best for your family is; Jonny joins a kids-group with children of his age with teachers who specialize in teaching the young tots with lots of play time and breaks to keep them warm and dry. While Mary joins an advanced kids-group and goes off learning loads of new technique and tricks by being challenged together with her new friends. And Mum and Dad join adult lessons. Now you are going to have a very happy family. By the end of the day, the kids will come back with stories of what they have done, about new friends they have made, and what they are looking forward to the next day. While you will have been able to relax and enjoy your time learning with other likeminded people. And what is best is, the ski school will even take your new ski stars for their lunch every day, dropping them back off with you at the end of the day. You have made it to resort, checked in to your accommodation, picked up your equipment and your all set for your first day on the slopes. All there is to do now, is enjoy your evening meal and get a good night rest. After all, you have been traveling most of the day, as ski flights typically leave early in the morning, so you have probably been on the go since the early hours. So the last thing you and your body needs, is a belly full of chalet wine. But guess what. This is just what so many people do! Well, it is free and tastes good, right? Dinner is served and more and more wine is put in front of you. You are on holiday and meeting new people and having fun. But stop there, think about it, it is free. And, in many cases, it is not quite as good as it seems at the time. And before you know it, you have sank several glasses. Then it is off to bed. What is that you say? Unfamiliar bed, room is too warm, the noise from the lift is keeping you awake, etc. Let us face it your body is in over drive. It is tired and trying to cope with the not so quality chalet wine. And this is just going to lead to a sleepless night and dehydration, which is not going to help you on the slopes in the morning. What most people do not think about, is that skiing is a sport and you are about to do 4 hours of sport in just 1 day. Now unless you run a marathon a day, you may not be used to so much exercise in 1 given day. Now we are not saying you can not enjoy a drink on your holiday, but you will benefit from taking it easy on your first night. We have been there and can tell you there is nothing like a first day chalet wine hangover to ruin a first day on the slopes. But the fun is not over. Through many years of research, We have developed a strategy that we call our “early out, early in” strategy, which we are happy to share with you today. This method allows you to enjoy a few tasty beverages, while still being fit for the slopes the next day. And given that most accommodations serve dinner from 7 till 8pm, it fits well. You will have no doubt heard of Après Ski. 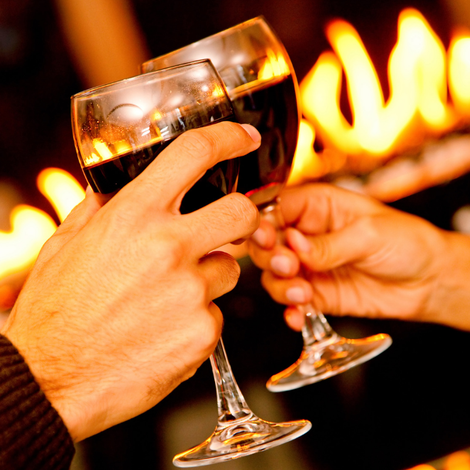 Après Ski starts directly after you finish skiing, so let us say around 4pm and CAN go on till very late. There is no need to go back to your accommodation, just rock up to a bar in your ski boots, put your skies on the rack outside and join the party! Safe in the knowledge that you are leaving before dinner is served. So “early out, early in”, you will be back in time for a shower and tasty meal. All resulting in a nice early night in bed and the all-important 8 hours sleep to get you ready for another fun day on the slopes! Great, good for you! But you are not at home, you are on a winter sports holiday and your body needs fuel. Sounds a bit harsh, although the amount of times we see people 30 minutes into a lesson who have nothing left in the tank, is crazy. This is one mistake you really should not make. You are on holiday and breakfast is all there for the taking. Cereals, cold meats, cheese, fresh fruit, dried fruit, bread, eggs, yogurt, jam, honey, Nutella, veggies, cake (yes cake at breakfast! ), pastries, tea, coffee, hot chocolate, fruit juice, etc. 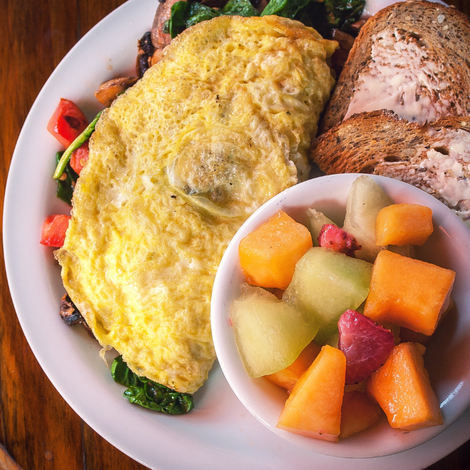 You name it and most accommodations will have all of this and more on offer and some will even have a hot option each day like sausages, omelettes, hot oats etc. When skiing, you are going to burn off calories at a very high rate. On average a 70kg person will burn off over 445 calories in just 1 hour of effective skiing. So in the region of 1000 to 2000 in a 4 hours’ ski day. This all needs to be replaced and it starts with a hearty breakfast. We also recommend popping something in your jacket pocket for your mid-morning snack. And we guarantee, by time lunch comes around you will be ready for another good feed. The fresh mountain air, altitude and exercise will all add to your hunger. So if there is one mistake not to make, it is this one! It is not cool and it is definitely not clever. In fact, it is damn right dangerous! The number of people wearing helmets has increased massively over the past few years, partly due to the high profile injure to Michael Schumacher and the death of Natasha Richardson in the Canadian resort of Mont Tremblant. And whether you think they are cool or not, most ski schools would rather you wear one than not. But get it right, and do not make the mistake of wearing sunglasses with your lid. Because you think it looks cool, when in fact it looks far from cool and is also dangerous for your eyes and face. When people wear glasses with a helmet, the arms of the glasses get placed inside the helmet on your ears. If you have a face-first fall or collide with another skier, or maybe a tree, the glasses can break in front of your eyes, resulting in glass shards getting into your eyes. The reason for this is the arms are trapped inside your helmet holding the glasses in place, over your eyes. The frame of proper ski goggles is typically made from a relatively flexible plastic, most commonly used is polyurethan. The frame will be backed with padding foam. 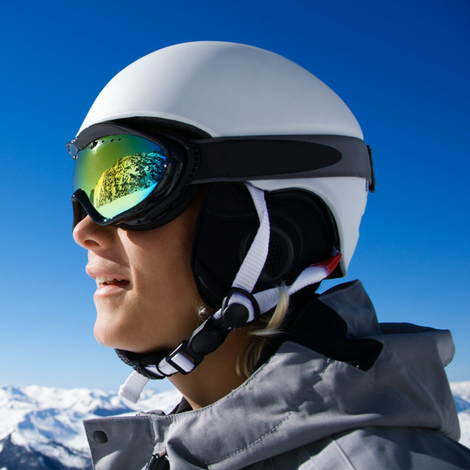 And most ski goggles lenses are made from a polycarbonate material that is shatter resistant. They do not just protect your eyes from the sun and snow glare, they make it easier to read the snow profile and also protect a larger area of your face from the wind, sun and snow. One thing to look out for when selecting a helmet and goggles is that you do not have a large gap between the top of the goggles and the edge of your helmet, as this does not look good at all. You want the two to fit together well for optimal functionality and style! We understand that people have busy lifestyles and find it hard to get to the gym. Although you can, in a very short time, get yourself fit-to-ski, which will result in a much more enjoyable holiday! Getting fit to ski will not just allow you to enjoy more time on the slopes, but will also reduce the risk of injury. 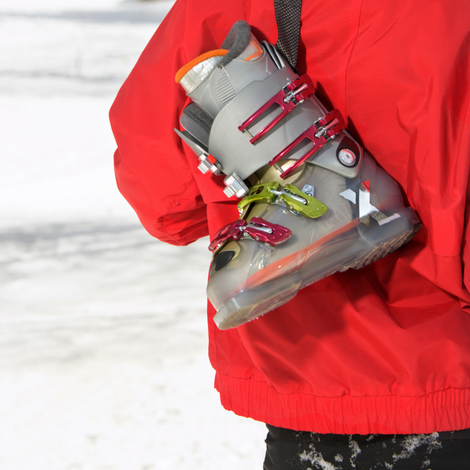 A good level of fitness for your first ski trip is crucial. For the development of your technique and to enable you to spend as much time on the slopes as possible. We often forget how demanding skiing can be on our body. On average you are going to spend 4 to 6 hours on the slopes each day of your trip. And do not forget you are at altitude, which makes the body work harder than you are used to. And even though we get to rest on the ski lifts, recovery takes a lot longer than normal at altitude. If you really want to spend more time skiing with a better technique and staying injury free, you will need an all-encompassing Fit-to-Ski program that includes: endurance, strength and flexibility. V. Stand straight up in your boots, can you feel your toes just touching the end of the boot? VI. Can you lift your heel in the boot? The less movement the better! You want your boots to feel snug not tight. Follow the above and you are more likely to get your boot size right the first time around. But do not worry if it does not feel good after your first day on the slopes, as the shop will allow you to go back as many times as needed till you get this right. Ok, so you are already to go! You have picked up your boots, skies, and poles and tomorrow you are heading to ski school. Things can be a little rushed on your first day, so give yourself plenty of time to get to your ski school meeting place. You do not need your regular shoes with you, you want to turn up ready to go. So put your ski boots on in your accommodations’ boot room. This way they will be warm from the start. And remember, the only thing that goes in your boots are your feet and your socks! Do not put your base layer leggings in your boots, or your ski pants. This will only lead to rubbing and sore skin and legs. 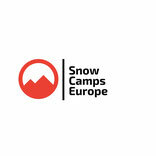 At Snow Camps Europe we want your time in the mountains to be the best it can be. And we can help you plan, organise and book your next winter sports experience to make sure your next trip to the snow is the best it can be. For more information or to book ski lessons, ski camps and to not make these mistakes, just send us your requests via our contact us page. Have you done any of the above? Tell us all about your ski holiday experiences it in the comments below.